The Old Dominion Mine is an epithermal silver-gold mineral system that is situated 23 miles north of Reno, Nevada along the south side of Nevada State Route 445. NexGen Mining currently controls 10 claims (200 acres) covering multiple veins along a structural corridor hosted in Tertiary volcanic rocks. The Old Dominion Mine model was previously explored as a caldera with deposits clustered around the margins of the ring faults. Recent work in the district suggests a more complex system with overlapping alteration and mineralization systems from nearby intrusives such as the Sullivan porphyry. The geochemistry from the structures suggests a low sulfidation model for the property. These multiple structures can be traced for over 4,500 feet along strike. The surface expression of the structures ranges from 3 to 10 feet in width. In addition, the widespread quartz-sericite alteration has been mapped at the surface throughout the project. The model and sample results support a “Fire Creek/Midas type” bonanza vein system. The surface expression of the veins suggests a similar scale with respect to contained precious metal ounces to that of the Midas and Fire Creek mines. Limited sporadic exploration has been conducted in the district. Historic production from the district is around 500,000 ounces of silver equivalent. Historic drilling intersected up to 0.50 opt gold; but thus far, the company’s claim block has not been drill tested. Surface sampling has obtained multiple +0.03 opt gold and +1 opt silver values in surface samples throughout the claim block with values of up to 0.17 opt gold and 22.9 opt silver. It is NexGen Mining’s intent to add to its current claim position through claim staking and possible consolidation of the district, enhancing the company’s current discovery potential. The company believes this project has the potential for +1 million ounces of gold and 20 million ounces of silver. The Old Dominion claims mineralization is hosted within the Miocene Hartford Hill rhyolite that has been altered to a phyllic assemblage and mineralized by quartz veins, breccias and fracture zones that host highly anomalous silver-gold-lead-zinc mineralization. 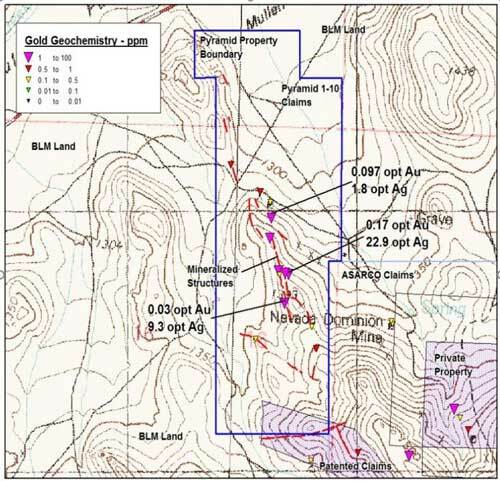 The property alteration is known to extend along a strike length of at least 4,700 feet with mineralized widths of several feet to at least 20 feet within the structural trend assaying up to 22.0 opt Ag, 0.17 opt Au, 7.0% Zn, and 5.0% Pb.